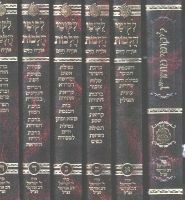 Author: Reb Noson Description: Second in importance only to Rebbe Nachman's original writings, Likutei Halakhos is Reb Noson's masterwork. Using key ideas from the lessons in Likutei Moharan as his guide, Reb Noson explores the mystical underpinnings of the laws in Shulchan Arukh. His creative genius is evident on every page as he weaves a tapestry of Chassidic wisdom that combines meditations on kabbalistic mysteries with down-to-earth advice on dealing with the challenges of everyday life. 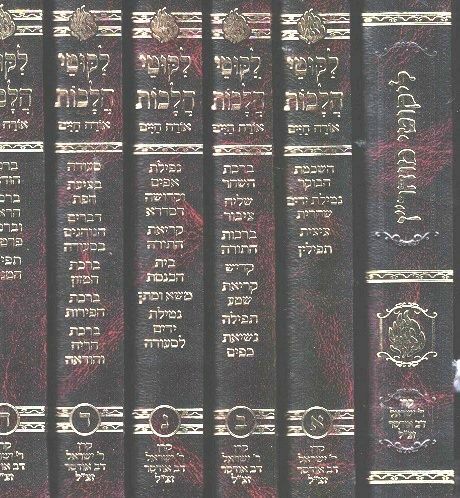 This latest extraodinary edition, which definitely surpasses all others, contains the following superior features : 1) From an original manuscript which was recently discovered, written by Reb Nosson himself, there are summaries and outlines on each halacha, printed before it as an introduction, and focusing on the main points. 2) Painstaking efforts were made to correct all mistakes by comparing the text to the original manuscripts and all later editions. 3) Thousands of new references (marei mekomos) were added, the basic ones (including those from Reb Nosson) in the text itself, and the less important ones on the bottom of each page. 4) Punctuation- To aid the readers comprehension , paragraphs, commas and hyphens were added. 5) Difficult and unusual words have been translated to simple lashon hakodesh. 6) Newly typeset ,with large and appealing font, and properly spaced for comfortable reading .7) contains many different types of indexes and Tikun Haklali in back of each volume. Publishing Data: Keren Odesser, Jerusalem 2015 5x7", twenty medium size volumes, compact and lightweight, ( 19 Likutei Halakhos, 1 Likutei Moharan) HB, with nekudos. Packed in attractive "Haesh Sheli" double decker box.